Forbes says Neil Patel is one of the top 10 online marketers, and Entrepreneur Magazine says he created one of the 100 most brilliant companies in the world. So, if he says something about SEO or content marketing it's kind of a big deal! Hear what he has to say about Squirrly - SEO WordPress plugin, "This is actually very cool stuff for helping make sure your posts are search-engine friendly without you having to do a lot of manual work". What's interesting is that he himself is using it. 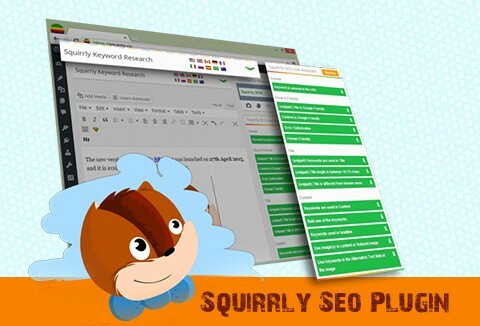 1,100,000 downloads, recommended by Neil Patel, Squirrly is the only WordPress SEO plugin that allows you to optimize content and measure its results. Optimized articles with Squirrly & get +285% more traffic. Gives you SEO Advice as you’re typing your articles. It's super simple. Squirrly helps you in real time to optimize your articles to 100%, while you are writing or editing them. You can also search for Images, Articles, Wikis and News, based on the keyword you want to optimize for SEO. You can also add these in your post for your external linking. You’ll be able to send problems related to SEO to your SEO person or to your developers, blogging problems to your content writers, etc. The Content Audit helps people figure out how well their whole Content Marketing Strategy works and are given a score. It displays social signals per article, which shows you how much people enjoyed your content. It also acts as a SEO analytics that displays authority, Google Ranking and others per article, not just as an overview of all the articles. Use for unlimited wordpress sites. Life time access once you pay for the deal.